￼￼Soft-touch electronic digital keypad allows for time/ temperature settings, operation of the Rapid Even Air System, standby procedure, activates light, informs user of all these functions & has LED display readout. Low gauss reading for Electromagnetic Field Radiation. 1/4 inch bronze tempered glass front wall. Full glass style door with etched logo. Rapid Even Air System which circulates warm air for a more balanced sauna. 2×4 Clear Western Red Cedar bench(es) with round edge. Surgical, stainless steel deflectors, ceramic heating emitters housing, and cover shield. Caster wheels on base of sauna make it easier to relocate or move. FM CD MP3 player with professional series coaxial speaker system for clear stereo sound. Ergonomic cedar backrest along walls for comfort. Vented light fixture. Sauna is pre-built; walls and ceiling are pre-fitted panels. Benches are assembled from the bottom, while all walls are blind nailed. 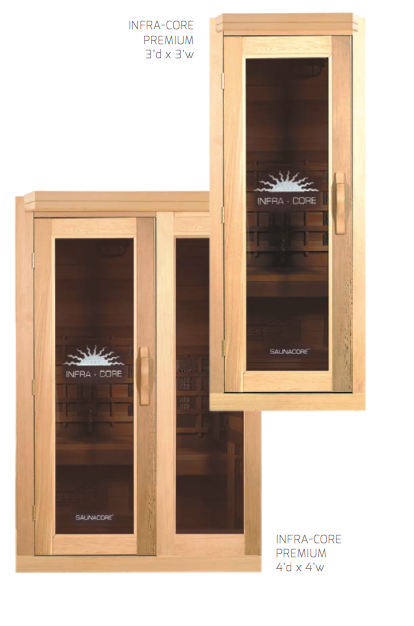 INFRA-CORETM saunas are handcrafted by experienced craftsmen to the absolute highest standards in the industry. LIMITED LIFETIME WARRANTY on radiant heating emitters and five-year factory warranty on all parts. Easy set-up operation takes approximately 30 minutes. Takes only 10 minutes to warm up. Separates into pieces – totally portable. Costs only $2-$4 dollars per month for electricity to operate. Rooms are also available in Poplar. Infra-Floor system – optional upgrade. Custom sizes available. We also carry a large assortment of accessories. up imperfections, all our cedar panels are custom cut and aligned to match from one wall to the other, all V-joint match up, each individual piece of cedar (or poplar) is cut and trimmed for an exact fit. Saunacore is one of the most extensive manufacturers of high quality sauna and steam products. Saunacore manufactures traditional sauna stoves, steam bath generators, modular sauna rooms, infrared radiant sauna rooms, do-it-yourself sauna liner kits, parts and repairs to all makes and models of sauna and steam equipment. Are Your Ducts Being Cleaned Correctly?